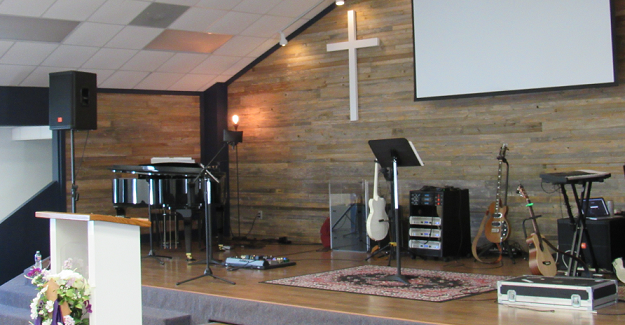 Thanks to the efforts of Billy, Mike, Brenda, Tylor, and Pastor Jay, our sanctuary looks better than ever. This crew spent many hours repainting the walls and hanging reclaimed cedar planks to create the lovely backdrop behind the stage. This is the kind of service that really can help make a difference in the worship experience of a local body. Service is a blessing, not only to those being served, but also to those who are serving. We all have God-given talents and abilities that can be put to good use within the body, and it is not only our responsibility, but our incredible privilege to discover where we fit in and to make it a priority to do so. Who, being in very nature God,did not consider equality with God something to be used to his own advantage; rather, he made himself nothingby taking the very nature of a servant, being made in human likeness. And being found in appearance as a man, he humbled himself by becoming obedient to death— even death on a cross! Every believer has something to give back to the body. What can you give?